Foundation and Philosophy – Go Ahead! “Leading responsibly” stands for prudent planning, personal accountability, responsibility for those being led, a positive attitude and a desire to always move forward. A platform for entrepreneurs and forward-thinking business people. A leading international think tank from and for entrepreneurs and business people, broadly addressing leadership, sales and sales management. 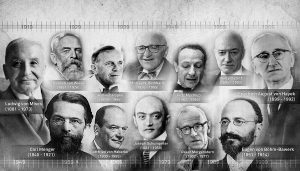 The first and only entrepreneurial platform based on the Austrian School of Economics. A driver of healthy dynamism in business and society. A thought leader and catalyst for responsible leadership. Go Ahead! Is the only international entrepreneurial & business platform based on the Austrian School of Economics. Go Ahead! is the only entrepreneurial and business platform that not only discusses general economic considerations, but deliberately focuses on sales (what we call the salespreneur) and the broad impact it has on society as well. Go Ahead! doesn’t operate at a macroeconomic level, but rather focuses on personal and practical leadership. Go Ahead! focuses on the fact that the first step on the path to more freedom, self-responsibility and entrepreneurial spirit must be taken by the individual. 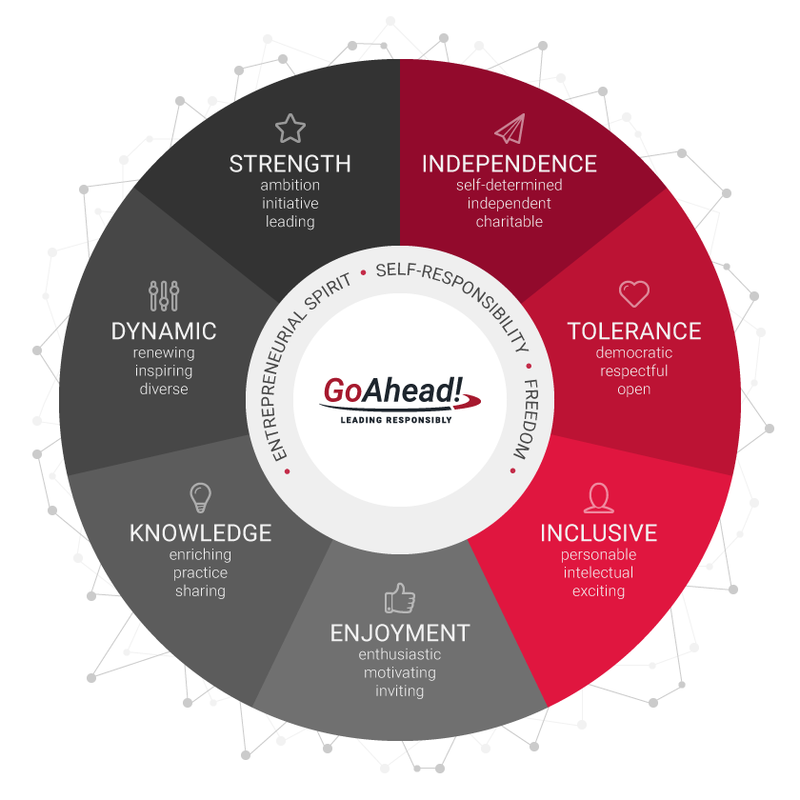 The primary core principles of Go Ahead! are Freedom, Self-Responsibility and Entrepreneurial Spirit. Each of these has their own unique qualities. Freedom is the most important element of an open society. To be free means to lead a self-determined life, without constraints; to be able to set one’s goals and make one’s own decisions. Where the freedom of the individual is affected, enforcement must end – even that of the state. The state should only intervene if individual freedom is violated. The state’s role should be limited mainly to the preservation of justice and freedom. Self-responsibility is a core value of a free society, directly connected with property and competition. The principle of self-responsibility is based on the ideal of a mature, self-determined person. Strengthening self-responsibility leads to an increase in moral level, and leads to an increasingly dynamic and optimistic society. To take responsibility for one’s own actions is the prerequisite for a free-market economy, which is the key to prosperity and growth. Entrepreneurship is the guiding principle of a modern free-market society. Entrepreneurship means the willingness and ability to take advantage of opportunities, and the successful breaking of new ground after weighing risks.It means following a vision and striving for positive change. The entrepreneur is one who always has great intentions, works with courage and commitment for the achievement of goals, and thereby inspires enthusiasm and hope in their environment. Salespeople certainly fall under this category, for they are “entrepreneurs within the enterprise” or, as we refer to them, salespreneurs. They possess the same qualities as an entrepreneur, applied within their own spheres. As you can see in the diagram below, these three core principles expand outward into more principles and core qualities. The function which distinguishes the true entrepreneur is the increase of ability to better achieve higher goals, and a real responsibility in conserving resources, instead of a mere accumulation of funds in self-interest. To have the ambition to enrich, through business, enterprise and society. To acquire and share knowledge, in order to assess the opportunities and risks of their decisions correctly. To always strive forward and open up new avenues. To have the will to lead people, the courage to formulate visions and the power to create new things, and to promote optimism and hope in our society. Founded in 2004 by Nikolaus Kimla, Go Ahead! is the first and only international entrepreneurial platform based on the Austrian School of Economics. The aim is to support entrepreneurs and business people in all areas of economic activity and to strengthen their confidence in the principles of freedom, self-responsibility and entrepreneurial spirit. Successful entrepreneurs and business people contribute their expertise and share their knowledge. Go Ahead! includes a website, print media, and events covering a wide range of interests and business sectors. Go Ahead! encourages dialogue and knowledge transfer. This means education, and education creates the future. This exchange of ideas expands the horizon, encourages responsible action and strengthens entrepreneurial thinking. We bring this idea into the world in order to initiate positive impulses in business, sales and society. This society, growing at a frantic rate, really needs strong leadership and great salespeople, salespeople being the peacemakers and wealth creators of society.